Franck is an awesome character. 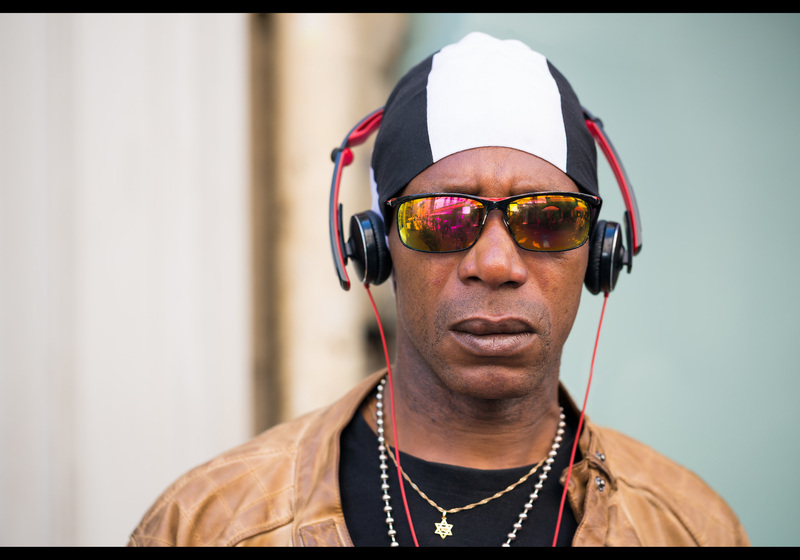 I’ve missed a few street portraits by not asking strangers with headphones. I’d always feared it would be intrusive, even rude, to interrupt their listening. When I saw Franck striding through the Centre Pompidou, I decided I’d have to break that taboo. As Saturday afternoon crowds ambled and shopped, he bounced through them with all the energy and warlike attitude of a Challenger tank on rough terrain. Here was a man of purpose. Stepping in front of him was no small feat of bravery, such was his stoney expression and relentless momentum, but signalling him he did stop. “You’ve got a very cool look, very strong,” I noted. He did not disagree; it was after all a pretty accurate statement. He was happy for me to shoot him, but late for work. “Keep up,” he said and surged off at a military marching pace. It was a good couple of minutes walk to the restaurant where he worked. Tables in the sun were packed with noisy dinners, sloshing wine and mussel shells, and throwing orders and dirty crockery at a head waiter already juggling six plates on each arm. Franck signalled him with an inverted nod of the head. “I’m getting my picture taken, ok?”. So we headed across the street into the shade, where a five second sweep of the street had identified some bars of complimentary colour that would serve as a background to echo the vertical bar of Franck’s tight hat. Franck took a hearty swig of the Champagne bottle he was carrying. “What?,” he queried. “It’s hot. I’m thirsty. Or do you want my photo with it?” It turns out Franck carries compact 187ml bottle of Champagne with him, as a thinking man’s answer to the question of whether Evian fits his brand. Hopefully the above report of our meeting doesn’t get him into trouble. He was a fantastic guy – with an effortless charisma to go with his deadly serious, rock-hard front. Devastatingly cool, and confident to a degree most of us could not conceive. I went for the “no Champagne” version of the shot – it gave Franck more centre stage, and the prop wasn’t needed in the visual. There’s a little bit of cloning in his shades – not removing me entirely, but chopping me up a little so my reflection doesn’t distract. Franck – Merci pour votre temps. Ne changent pas jamais. Votre énergie, votre confiance a été une source d’inspiration. This is portrait #48 of my 100 Strangers Project – check out the group page and get involved.